On 20 April 2010, a massive natural gas explosion destroyed the Deepwater Horizon oil rig in the Gulf of Mexico, killing 11 workers, sinking the rig, and releasing the largest marine oil spill in history. 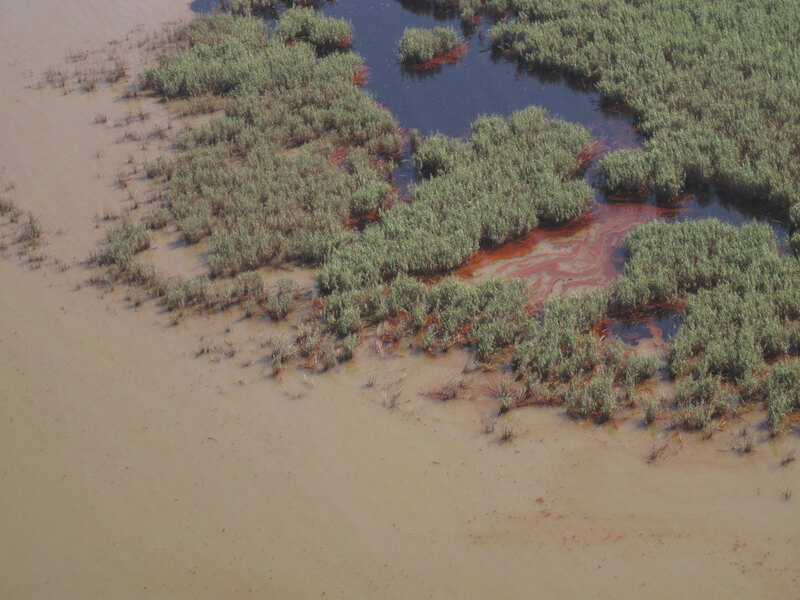 Oil slicks spread slowly toward the coast, reaching upper Barataria Bay in Louisiana by mid-May. At the time, the coastlines of the Mississippi River Delta were already retreating: Upstream dams that reduced sediment deposit in the delta, sea level rise, subsidence, and wave erosion had all eaten away at the coastal wetlands. Now Rangoonwala et al. show that oiling from the Deepwater Horizon spill may have made the delta’s wetland loss far more extensive. Whereas previous studies focused on only a few sites after the spill had occurred, the new work used synthetic aperture radar to analyze upper Barataria Bay’s entire shoreline position from June 2009, 1 year before the spill, to October 2012, more than 2 years after the spill and a few months after Hurricane Isaac hit the region. The researchers found that the areas with the heaviest oiling lost more shore area, likely because the oil kills off the roots that largely hold the marsh platforms together. Before the spill, recession occurred mainly on isolated sections of shore more exposed to waves coming from the gulf. However, widespread oiling led to shoreline retreat even in sheltered areas that were protected from heavy wave erosion. The losses continued for 2 years after the spill reached the bay. A sample of shoreline in Barataria Bay, La., that shows high shoreline recession after the Deepwater Horizon (DWH) oil spill. In more sheltered areas of coastline, oiling causes more shoreline recession than normal wave erosion or even severe storms. Credit: Rangoonwala et al. Shore losses from Hurricane Isaac, which hit in August 2012, are impossible to disentangle from continued oil impact losses. The hurricane’s surges eroded primarily more exposed coastal sections, so although its impact was more immediately severe, it was not as widespread as damage from oiling. Erosion from a storm should be episodic, unlike the progressive recession that was measured for 2 years after the oil washed ashore. Citation: Jacobsen, E. (2016), Oil residues accelerate coastal wetland losses, Eos, 97, https://doi.org/10.1029/2016EO064809. Published on 28 December 2016.